Thermal Imaging Techniques to Survey and Monitor Animals in the Wild: A Methodology provides a manual for anyone interested in understanding thermal imaging and its usefulness in solving a wide range of problems regarding the observation of wildlife. In the last decade, the cost of thermal imaging technology has significantly decreased, making the equipment more widely available. 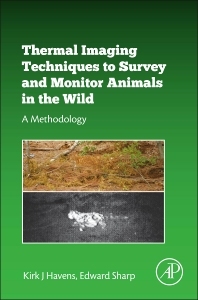 This book offers an overview of thermal physics and the thermal imager, along with a methodology to optimize the window of opportunity so that wildlife can be observed and studied in their natural habitat. Users will find the knowledge and tools to formulate a sound survey design, with detailed sections on the theory and performance characteristics of thermal imaging cameras utilizing cooled quantum detectors as the sensitive element and additional information on the uncooled micro bolometric imagers which have been introduced into the camera market in past decades. The methodology presented is logical and simple, yet it presents a detailed understanding of the topic and how it applies to the critically interlinked disciplines of biology, physics, micrometeorology, and animal physiology. Image intensifiers or thermal imagers? Kirk Havens was born in Vienna, Virginia and received his B.S. in Biology (1981) and M.S. in Oceanography (1987) from Old Dominion University and a Ph.D. in Environmental Science and Public Policy (1996) from George Mason University. He is a Research Associate Professor, Director of the Coastal Watersheds Program, and Asst. Director of the Center for Coastal Resources Management at the Virginia Institute of Marine Science. He also serves as a collaborating partner in the College of William & Mary School of Law Virginia Coastal Policy Clinic. His research has spanned topics as diverse as hormonal activity in blue crabs to tracking black bears and panthers using helicopters and thermal imaging equipment. His present work involves coastal wetlands ecology, microplastics, marine debris, derelict fishing gear, and adaptive management processes. He hosts the VIMS event “A Healthy Bay for Healthy Kids: Cooking with the First Lady” and the public service program “Chesapeake Bay Watch with Dr. Kirk Havens”. He is Chair of the Chesapeake Bay Partnership’s Scientific and Technical Advisory Committee. He was originally appointed to STAC by Gov. Warner and was re-appointed by Gov. Kaine, Gov. McDonnell, and Gov. McAuliffe. He was also appointed by North Carolina Gov. Perdue to serve on the Executive Policy Board for the North Carolina Albemarle Pamlico National Estuary Partnership and is presently vice-chair. He serves on the Board of Directors and is past Board Chair of the nonprofit American Canoe Association, the Nation’s largest and oldest (est. 1880) organization dedicated to paddlesports with 40,000 members in every state and 38 countries. Ed Sharp was born in Uniontown, PA, attended Wheeling College and John Carroll University and received the Ph.D. degree from Texas A&M University in 1966. He conducted basic research in the area of applied nonlinear optics at the U. S. Army Night Vision & Electro-Optics Laboratory and the U. S. Army Research Laboratory. Presently he is working as a consultant on the use of infrared imaging equipment in novel application areas. His major areas of interest include laser crystal physics, thermal imaging materials and devices, electro-optic and nonlinear-optical processes in organic materials, beam-control devices, optical solitons, harmonic generation, optical processing, holographic storage, photorefractive effects in ferroelectric materials and the study of animal ecology using thermal imaging equipment. He is the author or co-author of more than 100 technical publications and holds over 15 patents on optical materials and devices. He is a member of the American Optical Society. Presently he has been working on new methods for using thermal imaging to address issues related to animal ecology and natural resource studies with faculty at the Virginia Institute of Marine Science (VIMS), College of William & Mary.